When you’re traveling this fall, seek outfits that have the most layering potential. Not only will it cut down on the number of items you need to actually pack in that suitcase of yours, but you’ll be ready for any type of weather changes you might encounter while away from home. From blazers and jeans to chunky knits and everything in between, here are our favorite fall travel outfit ideas for the season to come, and beyond. Slip into a bodysuit for ease of wear when grabbing those perfectly slouchy vintage jeans. Top it with a tailored blazer to add structure to your look. Keep it simple with a printed silk blouse and high-waisted jeans that will take you through morning, noon, and night. The comfiest sweaters are sometimes the most fashionable as well, just like this bold striped oversized style. Layer up with a statement jacket that will take your fall travel look to the next level. Even when summer is over, indulge in one of the biggest trends of the season with a head-to-toe pastel look. 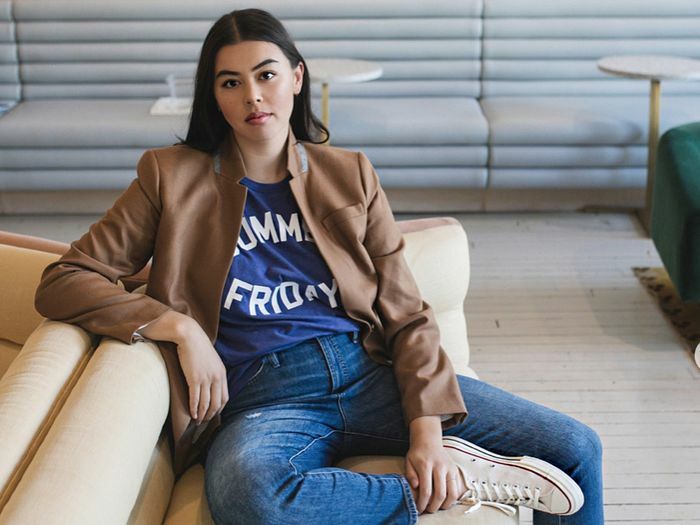 A blazer will instantly transform even the most understated T-shirt, jeans, and sneaker looks. Fashion denim on denim, but amp it up with the addition of a striped tee. Dress up your simple denim look by way of a heavy lace top that isn't going to wrinkle. Choose the chicest combos of all with a cashmere sweater, jeans, and blazer to top it all off. With your denim and blazer look, keep it comfy with sneakers, but elevate the overall appeal with a brightly colored lady bag. We love graphic tees when looking for that statement piece that will take your classic and understated look to the next level. Reach for elevated essentials, like a printed blouse, when looking for ways to dress up your most comfortable of boyfriend jeans. If you're about to wear the same pair of go-to jeans for a week straight, make sure to have plenty of gorgeous knitwear to mix and match. Look for those comfortable staples with head-turning details, like a pair of lightweight printed pants and a blouse top that wraps and ties. Take that classic look to new heights by choosing a distressed pair of denim that is totally unique. How will you dress for your next trip?